Adaminaby is famous for fly fishing, both for the quality of the trout and the beauty of the locations in which they are found. Eucumbene Dam has good fishing year round, both from a number of spots on the banks and by boat. 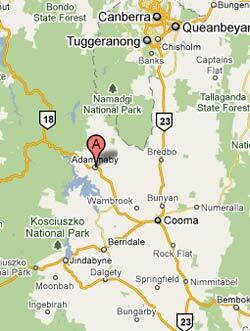 It is some ten km to the nearest point at Old Adaminaby, with easy boat ramping facilities. The lake, though low at less than 30%, still has 4 times the water of Sydney Harbour. Mostly stocked with good browns and rainbows, it has a healthy population of native browns from their spawning in the Eucumbene River, above the lake, during the winter. The Eucumbene River is accessible for fly fishers at a number of spots above the lake. Providence Portal provides the closest spot, where the colder waters from Tantangara Dam join the Eucumbene – good in hotter weather. A few km further up the road, past Gang Gang Creek the main valley can be accessed and provides miles of good fishing. Across the first range, round Kiama the Eucumbene meanders through the high country. The cold water meant the fish are active in the hotter months and the scenery is fantastic through the old gold country – watch for wild brumbies! The Murrumbidgee River has some great fly fishing, although access is more of a problem. In most cases you will need to approach the land owner for access, but the results can be well worth the effort. Tantangara Dam, some 25 km off the Snowy Mountains Highway before Provedence, provides an interesting trip for the keener angler. It has with good fly fishing from the banks in the right conditions as well as access for smaller boats. At time of writing, levels were particularly high, providing a much larger than usual dam – not a lot smaller than Jindabyne, with much less competition. Lake Jindabyne is a further drive but is well stocked with rainbows, browns and Atlantic salmon. Again, good fly fishing can be enjoyed year round and both Jindabyne and Eucumbene lakes are excellent for boat fishing. Glendaruel Cottage has good off street parking for boats. The rivers to the East of Jindabyne have been famous for fly fishing over the years, but the recent long drought has not been kind to some of them. The exception would be the Tredbo, accessible at a number of good places up the valley and the Snowy through from Guthega to Island bend. Whilst the rivers in the Jindabyne region would make a good day trip, there is more than enough good fly fishing in the Adaminaby region to satisfy, usually with less competition!